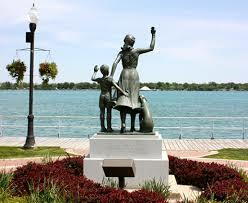 With a population of 59,775 as of 2016, St. Clair Shores is a city in Michigan. This number has actually dropped since the 1970s but still, St. Clair Shores MI continues to be renowned because of its facilities and programs. Within the city, the median household is about $52,775. Need Reliable Siding St Clair Shores Services? Siding protects your home the same way your roof does. It preserves warmth indoors, keeps pests away, and prevents air leakage. Most of all, siding adds to your curb appeal. This siding material is heavy duty plastic and lasts up to 40 years. Our team installs insulated vinyl for better weather performance and sound control. Highly resistant to UV damage and insects, fiber cement is one of the most durable siding materials. If you’re looking for something eco-friendly, this one’s for you. Maintaining a stable temperature inside your home is possible with stucco siding. When compared to traditional stucco, the newer version is more expensive but better in performance. Our siding St. Clair Shores repair includes replacing damaged pieces, repainting, and patching damaged areas. Serving St. Clair Shores and nearby areas within Michigan, our company puts your interests first. Why should you choose Miller’s Home Improvement over other contractors? We run a team of contractors who are licensed, certified, and know the weather challenges in St. Clair Shores MI. This expertise allows us to help you plan your new siding. One of the most important factors that affect siding lifespan is the quality of installation. We follow the manufacturer’s specifications at all times. Michigan homeowners note the fact that we anticipate their siding requests. We also welcome your suggestions that help us improve.